Joint Whyte and Mackay East Super League leaders Kelty Hearts welcomed Tayport to Central Park Today. Kelty being newcomers to the Super league soon put anybody who had any doubts as to how they would perform firmly in their place. Kelty bounced back last weekend with a fine result against Oakley after previously going down to Lochee in a close encounter. Defensively Kelty look solid looking at the latest League tables with only two goals against from eight encounters. Port who haven’t lost away from home in the league, know they will have to pull out one of their better performances to get a result today. Joint leaders Arniston are on OVD cup duty today giving Kelty the opportunity to go clear leaders providing they managed some sort of result today. The matchday programme recognised the threat Port brought to that possibility and made for some interesting reading. 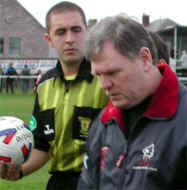 The final part being “ I only hope that their revival does not start until after today” Today’s match referee was Mr Tom Robertson. I don’t normally mention the referee but will today as he played such an important part in the direction of the match and have to be careful what is reported. From the kick off the match looked like it was going to be a close encounter with both teams testing each other in the middle. The opening ten minutes brought very little as far as any opportunities go but four minutes later and a major change was about to happen. Kelty were on the attack down the middle heading for the 18 yard line with J Ward heading for the challenge. Nothing out of the ordinary so far. The striker goes to Wards left sending the ball out right and both players tumble to the ground. The ball is met and sent across goal by the Kelty winger resulting in Frazer Fitzpatrick diving and the ball going very close to the opening goal. What happened next? The big central defender was given a yellow followed by a red. Why? I don’t know. Maybe words were exchanged but I don’t think it was for the tackle. Minutes later Brian Craik broke down the left inside the area going down after a challenge from Baillie, his resulting protest with the referee ended up with his name joining others who had fallen foul of the official pencil. Both teams continued to work hard and on the 20 minute mark a Port cross was back headed by the tall Brian Craik. The resulting clearance fell to John Elliot’s left foot 20 yards out. On the volley John let it fly for a spectacular strike straight into the upper right of the Kelty goal. The final 20 minutes if the opening period had both teams still working very hard probing each others defences. Many decisions were being questioned by both the visiting and home support. The second period opened similar to the first. Again both teams had their chances. Kelty switched on the after burner, running in on the Port goal like terriers. With the Port strikers helping out in defence Kelty’s Scott Lawrie struck with a superb right foot lob from 25 yards which had keeper Fitzpatrick diving backwards unable to get a touch on a ball heading for his left hand corner. Two goals and both spectacular wetting the appetite for the closing 25 minutes. 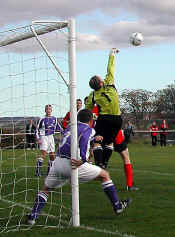 The equiliser gave Port the jolt they needed to get back into the match but Kelty were equal to it. Both teams continued to probe each others defences with Port getting the winner from Steven Stewart who struck from four yards after a corner from the right was sent back across the area. It was easy to see why the Jam Tarts are joint top leaders as the closing ten minutes had them once again running in on the Port goal constantly threatening. Ten man Port held out well breaking down the Right with John Elliot and left with Gareth Dailly. 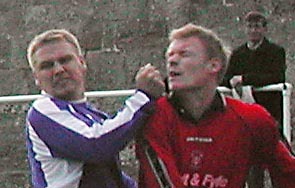 The gaffer sent on Kevin Heenan with minutes to go. Tayport - F Fitzpatrick, R Gunnion, G Paterson, J Ward, R Morris, S Stewart, J Elliot, G Dailly, B Craik, R Hunter, B McNaughton. Sub used K Heenan. Where were all the officials? in fairness to the home club they tried up until 2200 Friday to confirm assistant referees. With Scotland at Hampden and no senior football except one match. That left Div 1, Div2 and Div 3 officials doing what? Must also mention the Matchday programme, full of interesting reading and great quiz. A superb first half display by Port set them up with a 3 goal lead. John Elliot was on the score sheet again this week after putting Port one up from a Brian Craik pass which set John up to float the ball over the head of Boness keeper Campbell. Tayport continued to create chances with Sean Christie coming close to the target. Keeper Campbell pulled of a reflex save from a Roberto Morris header. Roberto's next effort found goal after a corner from Steven Stewart was flicked on by the tall Brian Craik. Close to the end of the first period another Stewart corner was sent goal bound this time a Boness defender got the touch and sent the ball into the roof of the net. The second half and Port added another to the scoreline after a superb through ball from Barry McNaughton found the inform John Elliot who rounded the keeper to slot the ball home. Tayport F Fitzpatrick, R Gunnion, G Paterson, J Ward, R Morris, B McNaughton, J Elliot, S Stewart, R Hunter, B Craik and S Christie. Sub used K Heenan for Brian Craik.